A gas hot water tank system. Natural gas hot water storage systems operate by placing a burner under the tank to heat the water inside. Cold water is pumped into the tank and sinks to the bottom where it is heated. As it warms it rises to the top and is siphoned off into your hot water piping when you turn on the hot water tap. A thermostat is used to control and maintain the temperature the water is heated to. Should the water pressure rise too high, water will be pushed out through the pressure relief valve and out through the overflow pipe. A flue runs through the middle of the tank to allow hot air to escape. 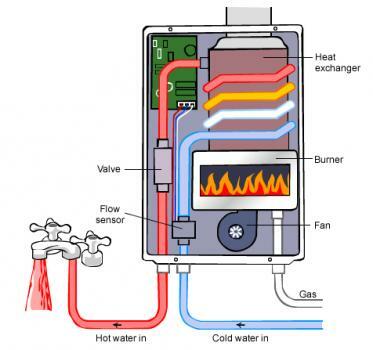 Continuous flow hot water systems operate by heating the water on demand. When the hot water tap is turned on, cold water is fed through a heat exchanger which heats the water and sends it through the piping. Natural gas can be used in both storage and continuous flow varieties of hot water system. It can also be used as a booster in solar hybrid hot water systems. Gas heaters are marked with energy ratings, ranked by how many stars the system achieves; the more stars the better. Higher efficiency models are more expensive up front, but cost less in the long run. Where are gas hot water systems most commonly found? 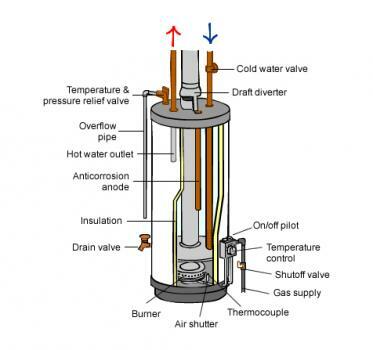 This type of hot water heater is available wherever natural gas is supplied in Australia, but is most commonly found in Victoria where the establishment of a strong gas infrastructure across the state has made natural gas widely available and easily accessible to most households. Is a gas hot water system for me? Natural gas tank systems are best suited to cater for larger homes with a high hot water demand. As a more energy efficient and cost effective method of heating than electricity, any higher initial outlay costs can be recouped in energy savings within a reasonably short amount of time. A continuous flow gas hot water system. Because gas use is generally billed at a fixed rate, it is possible to use a smaller tank system that heats more often. A similar electric system would be far more expensive due to peak electricity rates. 5-star or greater continuous flow gas hot water systems in particular are an increasingly popular choice in Australia, mostly thanks to their cheap installation costs, small size, relative efficiency and their ability to provide sufficient hot water for households of up to four people. The presence of natural gas piping (or gas reticulation, as it is more commonly known) is the only real requirement for installing natural gas hot water systems. Other considerations include the intended location and size of the unit you think you’ll need, as well as environmental factors. If located inside for example, you may need to install a vent or piping for the flue. 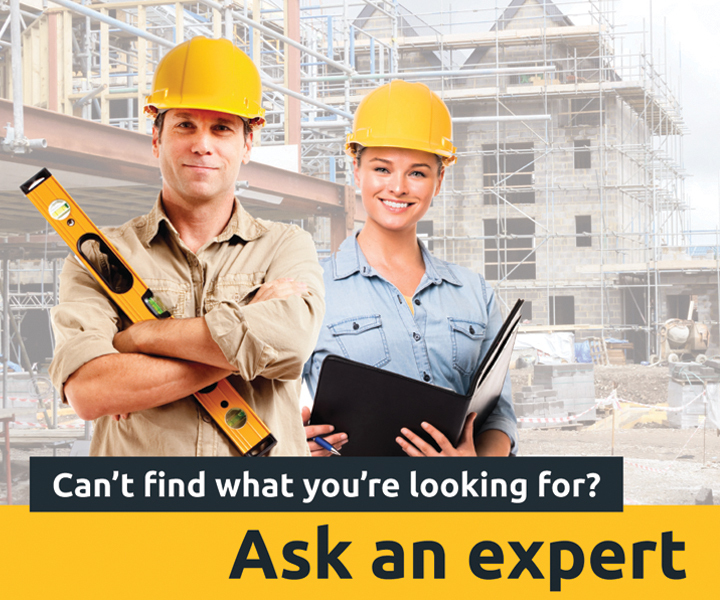 Some adjustment to your existing gas piping may be necessary to install it in the best location. Talk to your hot water supplier about what you will need.